The burger: Not content to produce one of the Twin Cities most remarkable burgers, chef Mike DeCamp is at it again. 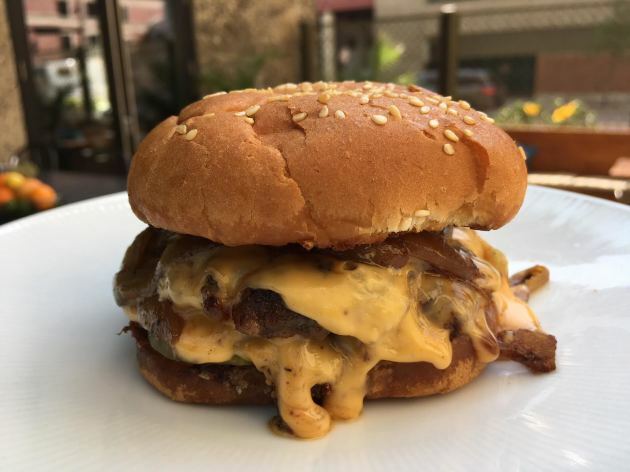 This time, for a summer menu he's composed for the patio at Monello, DeCamp has borrowed elements of the popular burger he serves at Constantine (the cocktail destination that’s a flight below Monello in the Hotel Ivy), then adds a few uncomplicated twists, including a second patty. He’s dubbed the results the “Dirty Double,” and, good readers of Burger Friday, it is phenomenal. Those two thin, small-ish patties will never be described as "bruisers," but they pretty much embody all that is good about the word "decadence," at least from a burger standpoint. DeCamp starts with the same over-the-top chuck-brisket-butter formula (the ratio is six parts beef to four parts Minnesota-made Hope Butter) that he uses for his Constantine burger. To make the “Dirty Double” really stand out, DeCamp goes one ingredient better, incorporating bacon to the grind. Along with that ridiculously tasty (if artery-clogging) beef-butter-bacon equation, what really makes this burger shine? The onions. DeCamp lavishes plenty of soft, sweetly caramelized onions over the patties. Which explains why he unabashedly piles them on, until that deep, earthy flavor infuses — but doesn’t overwhelm — every bite. When I asked DeCamp for details on the bun, the conversation was so memorable that I’m replaying it here. Nelson: That bun is fairly perfect for the burger. DeCamp: Yeah, it’s kind of like a cottage-style sesame seed bun, it’s kind of a Big Mac-ey thing. Nelson: Are they made on the premises? DeCamp: No, we buy them. Nelson: Where do you buy them? DeCamp: For real. I’m not trying to be cagey. We get them at Cub. And where's where this hamburger-bun snob learned a major lesson: one of the Twin Cities’ top chefs shops at Cub (“Chefs — They’re just like us!” would be the Us Weekly headline), then applies his know-how to flip a perfectly serviceable bun into an occasion. The secret? Butter (and plenty of it, of course), and heat. Warming the bun softens it (and subtly enhances its yeasty flavor), and when all that butter comes in contact with the stove’s heat, it transforms the bun’s inner flat surfaces, giving them a delicate and delectable toastiness. Follow this practice at home, folks. Your burgers will improve, without question. DeCamp also doesn’t skimp on the cheese. The patties are cloaked with so much bright orange American cheese that they could be mistaken for having been dunked in a fondue pot. His secret? He skips the large blocks of wholesale cheese and heads straight to the dairy case at Cub for packages of individually wrapped Kraft slices. “It’s just got a different texture from those big blocks of cheese that we would normally buy at the restaurant,” he said. He’s right: Kraft's gooey consistency is right on the money. (It does make me wonder: is separating cheese slices from their wrappers the most dreaded duty in the kitchen?). Yes, this a sloppy-looking burger, but it's not-too-big scale means that it's easily handled with two hands; just keep the napkins nearby. Final touches include a layer of crunchy, tangy pickles —along with a chopped pickle relish — tucked under the bottom patty. “It’s just all the familiar flavors, you know what I mean?” said DeCamp. I do, indeed. Price: $14, and totally worth it. Fries: Extra, at $7 a pop.